Supplementary material reads: "Balboa Bay Club. 1600 Coast Highway. Newport Beach, California. Note from Sylvia Weaver, Publicity Director... Hugh Stewart, left, formerly number one player at South Pasadena High School and now number one player of the University of Southern California Tennis team, yesterday won a hard fought battle over Clyde Hippensteil of San Bernardino to win the men's singles championship of the Second Annual Balboa Bay Club Invitational Tennis Tournament. 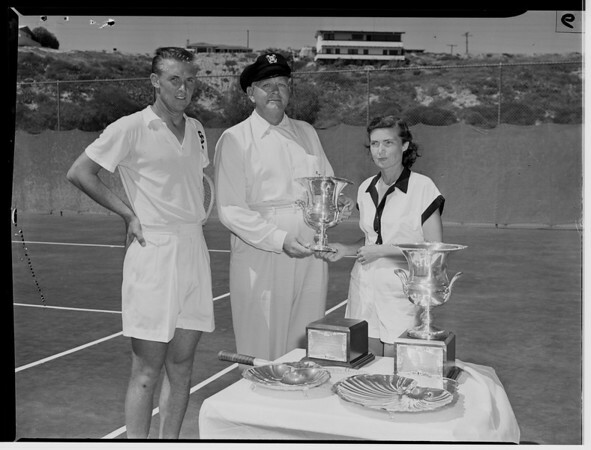 Stewart, left, is presented a trophy by Kenneth Kendall, president of the Balboa Bay Club, center, while Mrs. Mary Prentiss of San Bernardino, winner of the women's singles' championship yesteday looks on. (Photo by Beckner)".